Welcome back for another day of Stamp Highlights! Today we are looking at the fabulous Design Team projects using Oh Kitty Tree and Trim the Tree! These kitties stacks up to a lot of fun! We love the look of Amy's card on Kraft paper! She combined the Oh Kitty Tree with the Galactic Cover Creative Cuts. 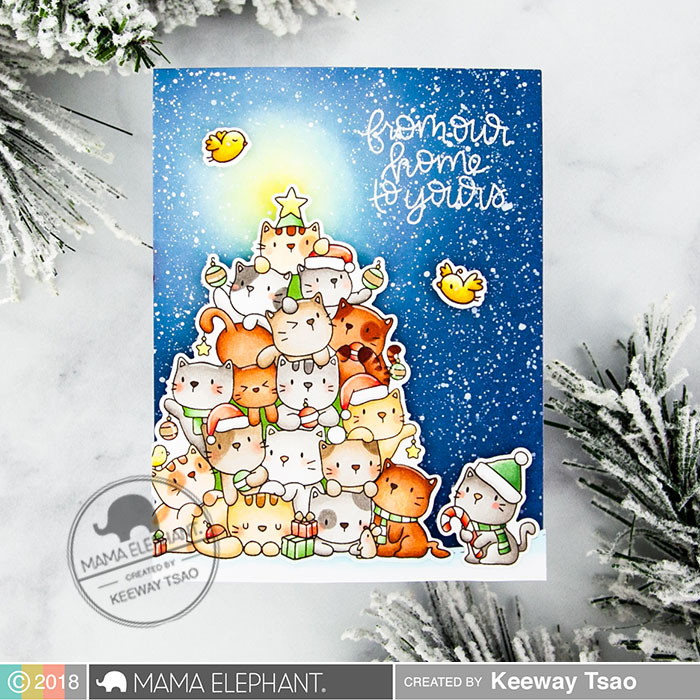 Keeway created beautiful holiday scene with the Oh Kitty Tree and Trim the Tree sets, paired with a sentiment from Scripty Xmas. Look at that gorgeous glow from the top of the tree! 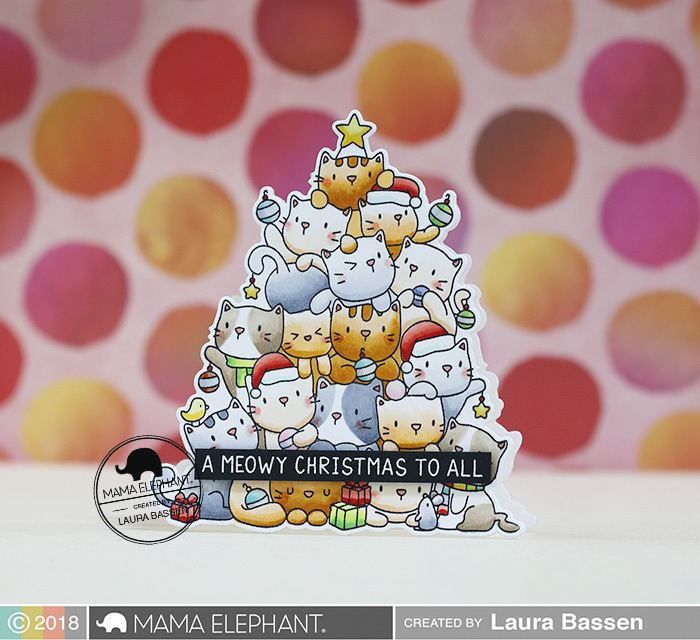 Laura created an adorable shape card using the coordinating Oh Kitty Tree Creative Cuts. We love how Thi combined a few birds from Trim The Tree with Oh Kitty Tree here. Can you find a sweet little Easter egg in her design? Super cute card by Vera! She combined the Galactic Cover with the Oh Joy Halo Script creative cuts to make this look! We love how Vera combed the Trim the Tree set with O' Tiny Tree set and framed the card with the Hexagon Frame from Hexstar Creative cuts. 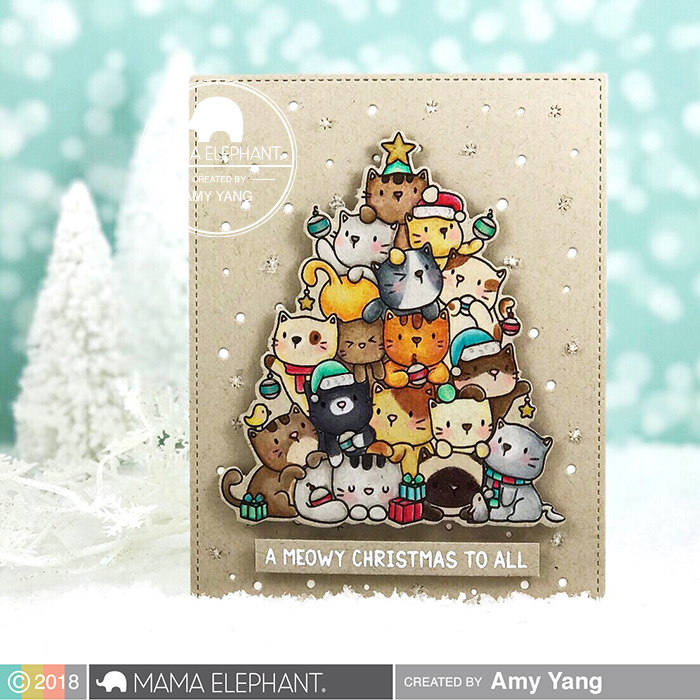 We adore this sweet Christmas card by Amy! Love these sweet cards! The kitty tree is one of my favorites from the release! The Trim the Tree set is adorable too! Love every card. So far I only have Trim the Tree & Yappy Woofmass. These are the cutest cards!I love them all! These are all wonderful, love this stamp. The Kitty Tree is my favourite set of the release. I can’t get enough of it !! All these cards are just awesome !! The Kitty Tree is coming to me soon and I am so excited I can hardly sit still (lol). I am squealing with delight at all these adorable cards made by the design team. They are so cute!!! I just love these kitties, especially the one who has one eye closed because a paw is squooshing it down. I need to add some Mama Elephant to my Christmas wish list!